My poor fiancee has been dealing with an awful flu all week, hence my absence. He's getting better, but we're not out of the woods yet. In the meantime, I did want to at least post something on the blog, feeling I've been leaving it idle for too many days. So, I'm going to share one more Badger Book before I share with you the best Badger Book in my collection, which I recently won on an eBay auction and haven't had a moment to scan yet. So, enjoy this great ape! He almost looks like he's a hybrid of a great ape and conehead. Love the title as well-- mark of the beast? Is this a Satanic ape? A Satanic conehead ape? 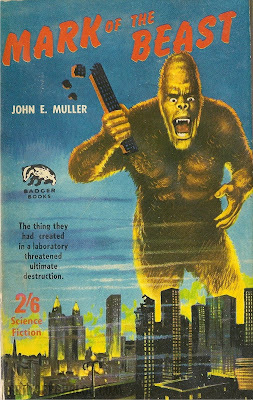 Probably... Badger Books are just that cheesy. Get well fiancee of Astrid!